Golf courses, like people, sometimes deserve second chances. This came to mind after I played for the second time The Golf Club at Harbor Shores, the well-publicized Jack Nicklaus-design in Benton Harbor. The first time I played it, a month ago in a charity outing, I was underwhelmed. In particular, the greens were “overwrought” and far too rolling, difficult and time-consuming for everyday play. Many of them reminded me of the greens designed in the early ‘90s when penal, target-golf, architecture ruled the day. My playing companions on that day were in agreement in spite of all of us competing in a player-friendly scramble! For starters, the conditioning throughout the layout is exceptional, especially for a second year layout. Tees, fairways, greens and bunkers are all in tip-top shape. The aesthetics of the course—how it looks and complements the environs—are impressive. The bunkering in particular is very well done. In fact, the bunkering on the par-three second hole is outstanding. Given a flat piece of land, set amid wetlands, Nicklaus’s design team plotted a nifty one-shotter that must carry a huge expanse of bunkers. 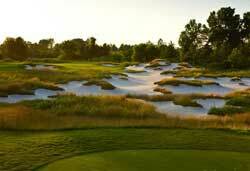 In truth, it’s largely a single bunker but one divvied up by little islands lending a more natural look. I also liked how the par-four sixth hole dealt with the daunting challenge of a large ravine that would have posed excessive difficulty for forward tee players. In sensible fashion, Nicklaus derived a simple solution: provide the option of an alternate green for those players unable to carry the ravine. It’s the sort of remedy that ought to be copied at many high end courses. The next hole, the par-four seventh hole, climbs a dune overlooking Lake Michigan and generates many player comments. It’s the number one handicap hole and it’s a bear even from the shorter tees which again wisely concede length. With the prevailing wind off the lake, this is one tough hole with a small elevated green surrounded by dune grass and sand. And if your shot comes up short, it will likely roll down the hill leaving a testing pitch back to the green. Overall, it’s too penal and unforgiving for my liking but given the nature of the dune and the desire to get players to the top of it probably any design would have been equally demanding. If it’s any consolation, the view is terrific. The most controversial aspect of Harbor Shores is the green at the par-five 10th hole. It’s over-the-top in terms of tiers and shaping and should be re-evaluated. Sometimes green designs work and sometime they don’t. This surely falls into the second category. If your approach shot happens to be on the lower portion of this four-tier green while the pin is on the higher level back, then good luck. It’ll be interesting to hear candid opinions about it from Tour pros playing it next year during the PGA Senior Championship. But after that hole, common sense prevails and Harbor Shores returns to normalcy. I particularly liked how the Paw Paw River weaves its way into the back nine on holes 14, 15 and 18. On the day we played, boaters were out which made for an unprecedented happenstance at the par-four 18th hole where the river runs parallel to the hole. A recommended side trip when playing Harbor Shores is to visit Four Winds Casino Resort in nearby New Buffalo. It boasts a first-class hotel, that’s already being expanded, with 165 rooms including 65 suites. The rooms are well-appointed with sumptuous bedding and furnishings and a flat screen high-def television. Best of all, the excellent sound-proofing for the rooms and hallways ensure a peaceful slumber for the heartiest of night owls. In addition to over 3,000 slots, including a special high limit slot area for the bravest gamblers, there are plenty of standard diversions such as Blackjack, Craps, Baccarat, Pai Gow™ Poker, Three and Four Card Poker. Live traditional poker is available seven days of week at World Tour Poker Room where you can either sit at a table with other patrons or go it alone at the electronic Poker Pro tables. And between 10 am-2 am, there’s live Keno where $100k could be won. For our merry group of golfers, the highlight of Four Winds visit was the superb Copper Rock Steak House Restaurant. We were nicely seated in a private 16-person dining room which allowed us to recount with lots of laughter the poorest golf shots of the day. The service was top-notch and the menu included a three-course special (with several entrée options) for $35 which proved to be a wise choice. Our group readily gave the Copper Rock high marks for food, service and ambiance. Oh yes, there is indeed a huge copper rock on display just inside the main entrance of the restaurant. To the host Potawatomi tribe, copper holds special ceremonial meaning and value. Unfortunately, rubbing it for good luck didn’t pan out. Oh well. A most pleasant time was had by all.